I found my first internet community right after I got the internet for the first time, when I was 9. This was in 1996. 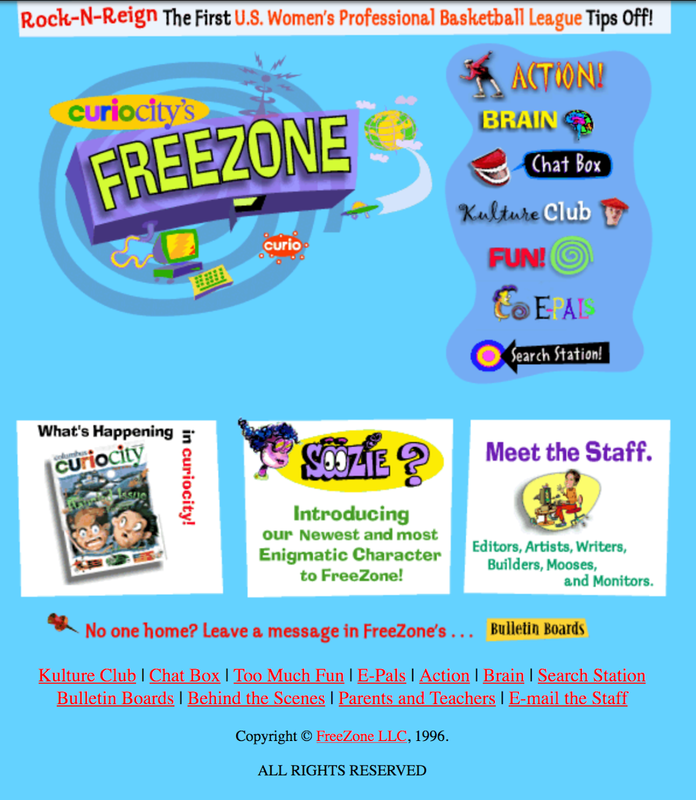 Freezone.com was a website meant for kids. I found it in the Yahoo! Directory under the Kids section, and I think it piqued my interest because I was looking for chatrooms. Chatrooms were an immediate focus for me, exploring the internet, because I had watched my cousin use AOL Chatrooms earlier and a person who installed the internet for my family showed me IRC. Freezone had a similar zine-like, cut-up, Nickelodeon-magazine aesthetic to gURL.com which I think was just common in kid-oriented print materials at the time. Freezone seemed to be a legitimate operation, which really speaks to the beautiful idealism of the early web. 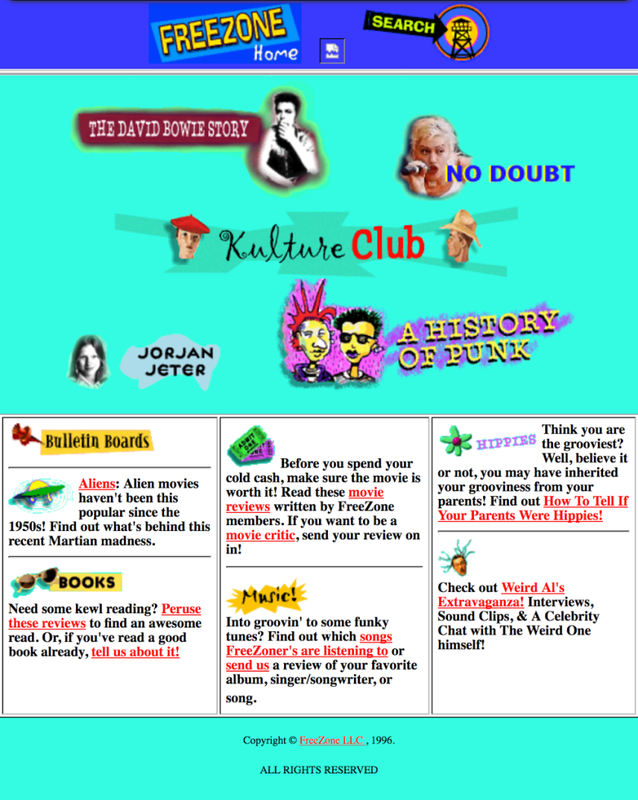 It had chat based on HTML, and I would have to manually refresh the page to see new messages, although later it had a Java Applet version with several rooms. It also had bulletin boards and ways to find “e-pals” (like pen pals but more hip, according to them). I met several other 9- and 10-year-old girls and we quickly moved to using ICQ to communicate, since that technology was better. We talked about everything, solo and with each other in group chats, and also sent snail-mail letters back and forth featuring, in addition to stories about our lives, lip balm and perfume imprints. The Freezone chat was moderated by real adults — probably college students — and I remember a particular drama in which two of them had gotten laid off and it made us all really upset, so we sent a lot of rude messages to the moderator we thought was the “boss”. I think her name was Sandi. One of the “favorite” moderators was named Lars, although he admitted that it was a pseudonym. There was another called “Mooselips”. My username was Momo321. My brother had typed in Momo because it means “peach” in Japanese and I added the 321 because I needed a unique name, and I liked the magazine 3-2-1-Contact. I remember another username, allycat9. I remember a girl in England that went by Gig, two girls in Canada that went by Roni and Sami, and a few more. I’m pretty happy with what can be found on the Wayback Machine, but what makes me upset isn’t digital loss, but rather analog loss: I no longer have any of the dozens of letters I exchanged with any of these girls, and we naturally fell out of touch over the years. When I was 12, I discovered The Palace. The Palace was a 2D graphical chat platform, and people could set up and host their own servers (kinda like how Mastodon operates, as distributed social networks were the norm, back then). You could “dress up” into different avatars, share them, create your own, or modify them or paint on the screen. It’s worth noting there was a palace sponsored and hosted by the Sci-Fi Channel (now SyFy Channel) and by the band KoRn. I used to frequent the Sci-Fi Palace, called The Mothership, quite a lot, and was pals with usernames like Evil the MoTh, Flem, Dr. Phibes, Pegasus, etc… but I could most likely be found on the Pokemon Palace. The interesting thing about Pokemon Palace was that it was ruled by 15-year-old boys because one of them was able to convince their parents to buy them a server set-up. They ran the place as you would expect teenage boys to do, which I would call maybe a “random chaotic dictatorship” model. We all had usernames to begin with, but mostly began just going by our first names, since it was such a small community. Pokemon Palace had an associated bulletin board set up, too, and I really miss it the most. I am still in touch with a few people from here, and I met one of my closest, life-long friends on The Palace when we were 12. The Palace can still be downloaded and used today, but it’s mostly a ghost town.